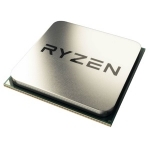 Intelligent, revolutionary AMD Ryzen processors are designed to bring you the ultimate, high-performance computing experience. The latest revolutionary AMD multi-threaded processing technology gives you blazing fast performance when you work or play. AMD Ryzen Processors with Radeon Vega Graphics are armed with some of the most advanced, powerful computing and graphics hardware available today, fused together in a single processor to deliver the high performance you need for demanding work and serious play, without compromise.